Atomflot service base north of Murmansk does not have enough berths to serve the fleet of new icebreakers under construction. Sailing the Kola Bay shows you the challenges facing Russia’s fleet of civilian nuclear powered vessels. Just north of Murmansk, actually only a kilometer from the nearest block-of flats, is Atomflot, the berthing quays and maintenance base unique to the world. Here, the giant icebreakers changes spent nuclear fuel. Radioactive waste is stored on-shore and the vessels are prepared for their next voyages crushing the ice along the waters north of Siberia. But there is a problem, the berths are too few for all the icebreakers and support vessels that are calling. 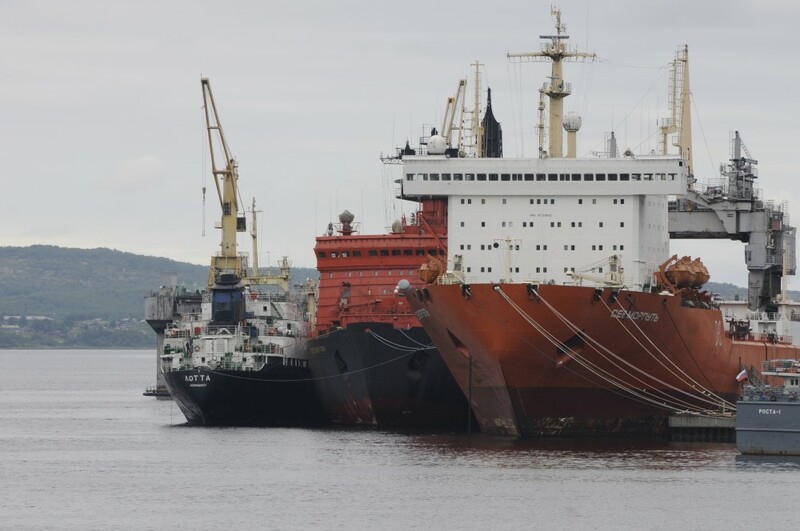 For radiation safety reasons, and terror threats, these group of vessels can’t make port call to quays other places in Murmansk, Russia’s hub for Arctic shipping. The urgency lack-of-space issue was discussed at a round-table in Murmansk last week. The nuclear-powered icebreakers and transport vessels for spent nuclear fuel are already staying side-by-side in port. You seldom see free quay-spots. And next year, it get worse. By the summer of 2018, Russia’s first floating nuclear power plant, the «Akademik Lomonosov» will be towed from a yard in St. Petersburg to Atomflot for a one-year reactors testing period. This will happen simultaneously as «Rossita» a transport vessel for spent nuclear fuel will sail in shuttle between the run-down Andreeva Bay storage and Atomflot with old and highly radioactive uranium fuel elements. Atomflot has the only loading facility to railway for the special designed casks for spent nuclear fuel. Then, by the summer of 2019, the first new icebreaker of the LK-60Ya class will enter service and make port-call to Atomflot. Named «Arktika» this icebreaker is even bigger than the current largest icebreaker «50 let Pobedy». Two other of the same class, the «Sibir» and «Ural» follows in 2020 and 2021. All the three new icebreakers are 173 meters long, 14 meter longer than the current «50 let Pobedy». Russia has also made a principal decision to develop even larger nuclear powered icebreakers, the LK-110Ya-class with a length of 200 meters and a width of 40 meters. If financially approved, construction could begin in 2023, with deliveries starting a few years later. Additional to the transport ship «Rossita», Atomfot has their own two storage vessels for spent nuclear fuel, the «Lotta» and «Imandra». Last month, Central Design Bureau Iceberg was awared the tender to develop a brand new auxiliary vessel for spent nuclear fuel from civilian ship reactors of the new models. It doesn’t help the situation that three of the old, retired nuclear icebreakers are still at quay. These are the «Rossia», «Sovietskiy Soyuz» and «Arktika». They are all awaiting for the shipyard Nerpa to get funding, space and time to do the comprehensive decommissioning work. Last year, the old «Sibir» icebreaker made her final voyage from Atomflot to Nerpa where the two reactors are to be cut of and prepared for long-term onshore storage. Rossiskaya Gazeta recently reported that one reason not to hurry decommissioning of «Arktika» is that the icebreaker might be turned into a museum, like the Soviet Union’s first nuclear powered icebreaker «Lenin» which where laid-up in the central harbor of Murmansk after all radioactive parts of the reactors where removed. «Arktika» was the first surface vessel in the world to reach the North Pole on August 18th, 1977.